If you have a knack for shooting with your Nikon D3100, D5100, or D7000 slightly misaligned with respect to the horizon line, it means that photos often wind up crooked. An inability to “shoot straight” might makes you especially fond of the Straighten tool on the Retouch menu. With this filter, you can rotate tilting horizons back to the proper angle. 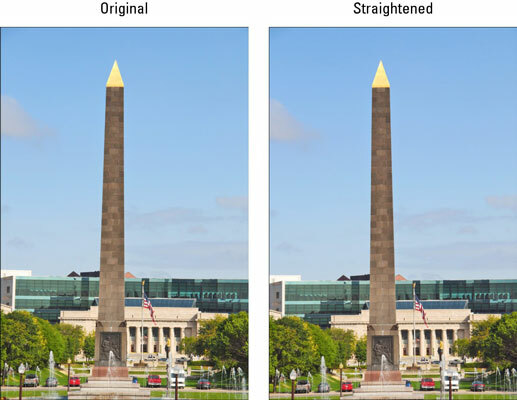 To achieve this rotation magic, the Nikon DSLR must crop your image and then enlarge the remaining area; that’s why the after photo contains slightly less subject matter than the original. (The same cropping occurs if you make this kind of change in a photo editor.) The camera updates the display as you rotate the photo so that you can get an idea of how much of the original scene may be lost. Display the photo in single-image playback mode and then press OK to get to the Retouch menu. Highlight Straighten and press OK.
You see a screen with a grid superimposed on your photo to serve as an alignment aid. To rotate the picture clockwise, press the Multi Selector right. Each press spins the picture by about .25 degrees. You can achieve a maximum rotation of five degrees. The yellow pointer on the little scale under the photo shows you the current amount of rotation. To rotate in a counterclockwise direction, press the Multi Selector left. When things are no longer off-kilter, press OK to create your retouched copy and save it to your D3100, D5100, or D7000.